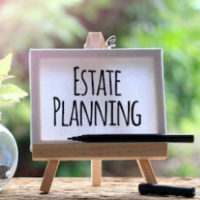 What most people think about in estate planning in the event of their death is how to make sure a loved one’s beneficiaries are taken care of, but what about surviving spouses? Most-everyone focuses on administering the estate of the decedent, but very little attention is given to the legal needs of the surviving spouse, even though, in many cases, there is a surviving spouse, and they have similar needs as a decedent’s beneficiaries. Although surviving spouses have a lot on their minds after their loved ones pass away, reviewing legal documents as soon as possible in order to ensure that they are protected is absolutely essential. This includes having both their trust and will reviewed at that time, as we discuss below. Let’s look at a hypothetical couple: When they marry, they change the beneficiaries on their retirement plans to each other, and open brokerage and savings accounts. If one spouse has children from a previous relationship, that spouse then decides to leave the children as the beneficiaries of their insurance policy, which, in this case, is worth about the same as what the retirement plan is worth. Over time, as the couple accumulates more investments, they start to realize that their original plan is inadequate. Why some may decide that they do not care what happens to their assets after they die, or that preparing the right estate plan is simply too much to deal with at the moment, estate planning involves constantly updating documents that need to be adjusted and added to, which includes such important elements as health care proxies and trusts. Beneficiary designations: beneficiary designation forms for bank, brokerage, insurance, and retirement accounts all need to be reviewed by the surviving spouse once the other spouse dies. This is especially important if the surviving spouse inherited retirement funds because the alternate beneficiary on the decedent’s form no longer applies, and the surviving spouse will need to submit a new designation of beneficiary form. While every estate plan is different, there are some very important basic elements that you and your attorney must cover. Contact the office of Gierach and Gierach, P.A. today to find out how our experienced Orlando estate planning attorneys can help you get on the right track.